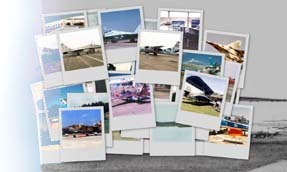 The photos posted to Roy's Russian Aircraft Resource, for the most part, are rare and in most cases have not been published before, neither in any magazine nor book, nor on the Internet. I, Roy Cochrun, took many of them, and when I have, I state that fact with the picture's description. Others were taken by friends, some of whom wish to remain anonymous. Still others were taken by other friends whose name is provided with the description of the photo. And some are official US Government photos (which have no copyright on them at all). Although the photos I have taken are not registered with the U.S. Library of Congress, I am permitted by U.S. law to consider them copyrighted. In the case of those photos taken by me, they MAY be re-published in electronic form on the Internet, AS LONG AS I am named as the photographer. Those photos, however, MAY NOT BE USED IN ANY PRINT MEDIA, such as books, newpapers, magazines, etc, nor may they be used in any electronic collection such as CD-ROM, floppy disk, tape, or other electronic media (except on the Internet) without my express permission IN WRITING. A fee will apply for print or magnetic media. You may of course, use them on your own computer for such things as wall-paper, for research, or as part of your own private collection. You just may not sell them or claim that you took them. Photos by friends, whether anonymous or named, may be re-published in electronic form on the Internet. If the photographer is anonymous, please state with your posting that the photo is from "The Roy Cochrun Collection." If the photographer is named, please state that the photo is by that individual, and add "via Roy Cochrun." If the photo is a U.S. Government photo, please so state. The U.S. Government photos may be published in any form with few restrictions, as far as I know. NASA's copyright statement gives a good description of allowable use of government photos, their own in particular. A good overview of copyright law for multimedia is provided by the University of Iowa libraries site.